I can't find a source for this, and that number seems much too high to me (although I don't know much about the subject). Is this true? 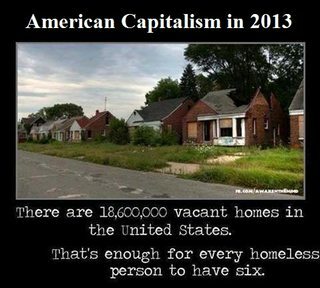 If not, what is the actual ratio of homeless people to vacant houses? No, the proportions are far more extreme than six vacant houses per homeless person. There are 633,782 people experiencing homelessness on any given night in the United States. The ratio of 13,970,000 : 633,782 is greater than 22 vacant homes per homeless person. The number of vacant houses seems to be correct for 2009 (but seems to have fallen since to 14M, see below). The number of homeless people may be much lower (~630,000), but that may depend on definition. Using these numbers brings the ratio to 22, and given that a house can house more than one person, the ratio becomes more pronounced. The numbers may have been originated from amnesty - http://blog.amnestyusa.org/us/housing-its-a-wonderful-right/ but I did not find their source.